I count myself very very lucky for many reasons. First of all, not only have I been at home with Mrs S for a month after surgery, I have been on a "too much time on my hands" spending spree and bought lots and lots of wonderful toys (see my New Additions page) and despite all of the deliveries and being underfoot, she has not murdered me in bed! I suspect, listening some of the not so under her breath muttering, that it has been a pretty close thing and I damn well better get back to work soon or I will be an ex-puzzlemad! 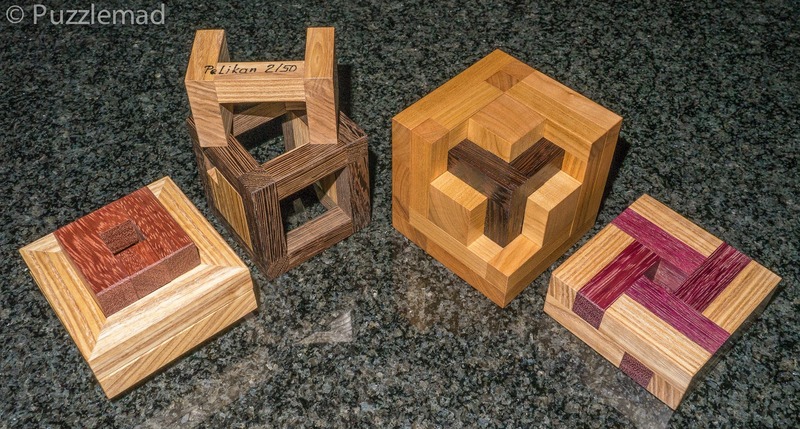 A particular reason for me to feel lucky is that my friendship with Jakub and Jaroslav at Pelikan puzzles allows me the opportunity to buy their latest offerings ever so slightly early and this year I have some reviews for you that may help you with your last minute Xmas gift buying for the special puzzler in your life. Yes there are some fabulous new toys available and I got 'em all! Lucida is another brilliant design by Osanori Yamamoto. When you see that name you should straight away think of rotations. 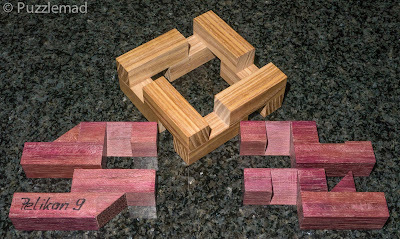 Allard had already recommended this one to a few people on Facebook and I had seen that another very talented puzzler (my friend Richard Gain) had 3D printed it and then spent 3 weeks before managing to assemble it. This made be ever so slightly fearful of this one. 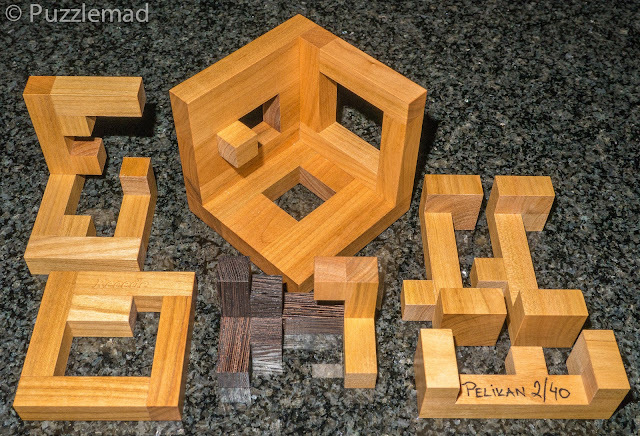 It has been beautifully made and is sent out disassembled with the pieces cleverly locked together. So far in 6 days of concerted play, a number of ideas have occurred to me but so far none have worked - I am blocked at every turn - my head hurts just now because I seem to have run out of ideas. I did find for 5 heart-stopping minutes I had everything locked together and couldn’t get them apart at all - eventually I managed to undo what I had done! Just like the Identical Twins, this puzzle is such a simple idea and yet this one is tremendously difficult. I will keep going and hopefully not take 3 weeks! 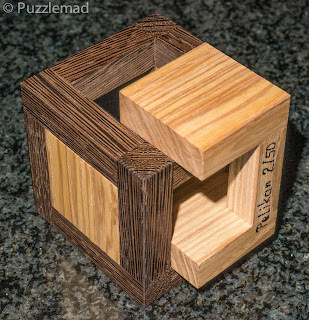 This is a great puzzle for the true puzzler - if Allard says it's good and Rich found it tough then you can be sure that this is well worth buying! Coriolis is another new design by the incredibly prolific Lucie Pauwels and has been made by Jakub and Jaroslav in a number of different finishes (I chose Ash and Purpleheart). Recently Lucie has been focusing on puzzles that require rotational moves in their solution - the Knobbel puzzles are more traditional Turning Interlocking Cubes or cuboids but she also has been looking at other interesting shapes. It consists of just 4 simple pieces in a complex frame and the aim is disassembly and then reassembly again. The first disassembly is a nice voyage of discovery - it is not really difficult but does make you realise that what looks so simple in construction is actually much more complex inside. Coriolis pieces - more complex than you would expect! The real challenge however is the reassembly after you have scrambled all the pieces and left them a while. It is not hugely tough but takes a little thought and planning. This is certainly suitable for a beginner but experienced puzzlers and collectors will want a copy too. It also looks lovely on display. Top is another fabulous design by Osanori. Again you should straight away think of rotations. 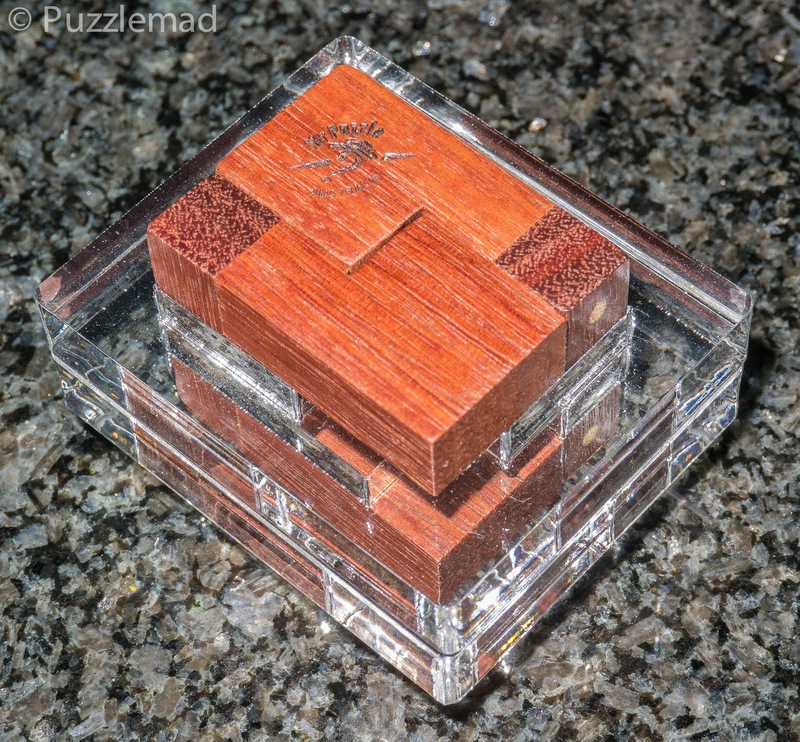 This puzzle has been beautifully made by Pelikan from Ash and Bubinga with perfect tolerances and a couple of tiny magnets prevent the pieces falling out of position. The aim again is disassembly and then subsequent reassembly. 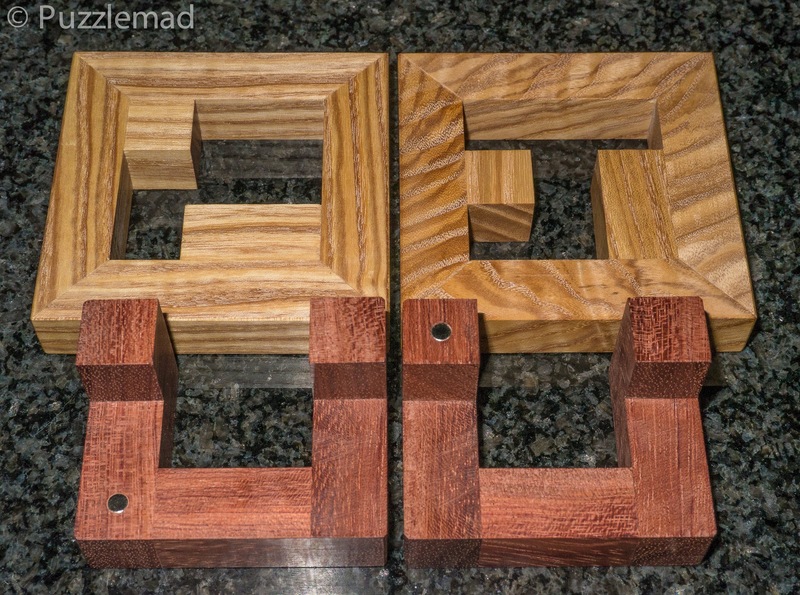 There are a good few linear sliding and rotational movements possible and careful analysis of the board shapes is required to get the pieces into just the right positions to allow a clever rotation to occur. After a few more moves the first piece comes out. I expected the other piece to come out linearly after that but no, Osanori would never make it that easy. 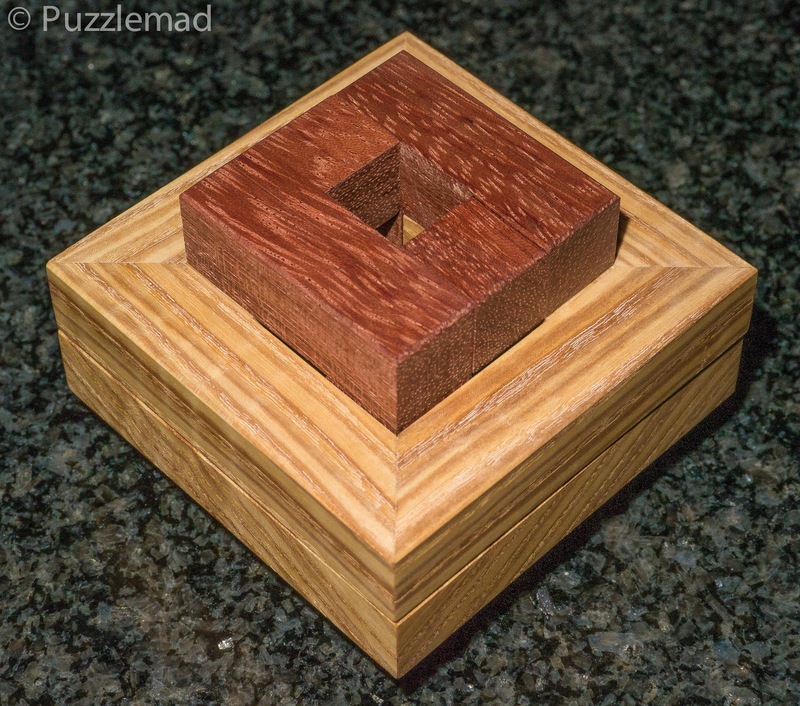 There are 2 choices for the last piece removal – both require more shuffling and rotations. A similar but opposite movement to the first piece surprisingly failed. Further thought required and I had 4 separate gorgeously made pieces. Just look at the grain on that Ash! I heartily recommend scrambling the pieces and leaving them a while before reassembly. Then you have a real challenge on your hands! 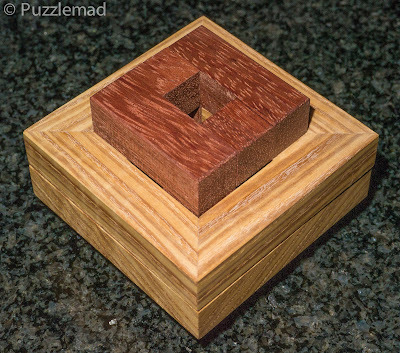 The reassembly of this puzzle requires some real thought if you make a proper attempt to ensure that you haven't just memorised the moves. It is perfectly manageable and great fun. 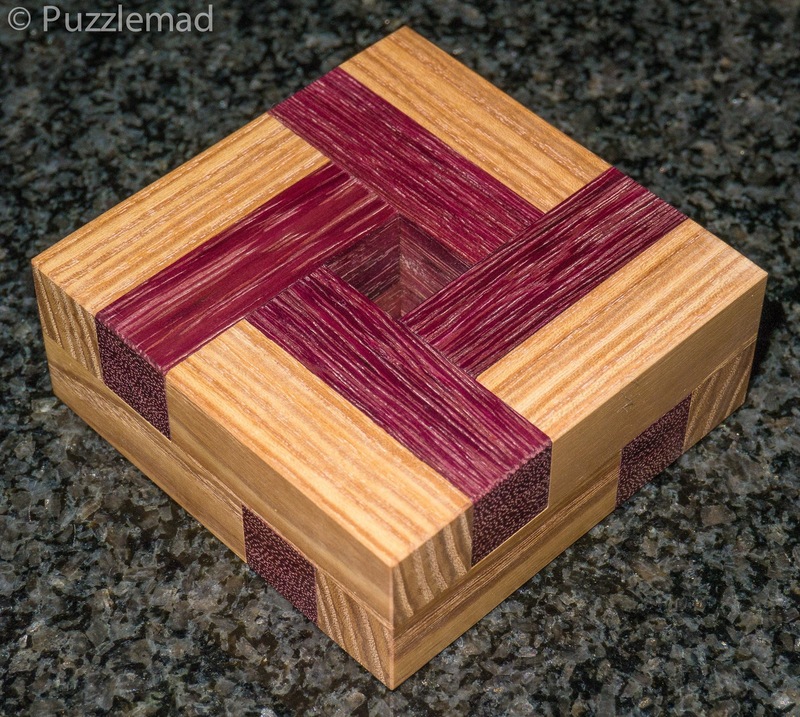 A similar design is available from Brian Young's MrPuzzle store. 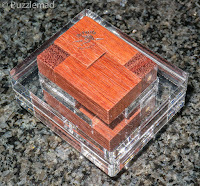 He has made another puzzle by Osanori with similar moves - the 2 & 2 in Acrylic and Western Australian Jarrah. It is just as much fun but much smaller. Of course all serious collectors need to have both! Recede is, I'm afraid, already sold out on the Pelikan site. This is the third of Alexander's designs to be commercially produced (I raved about the first two here). 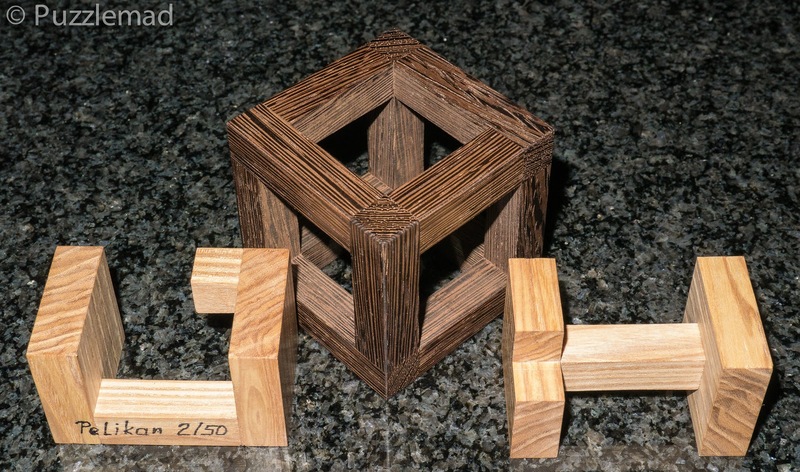 This is just slightly more conventional in shape than the Tortoise and Knot on my watch puzzles but still has elements that are highly unusual. 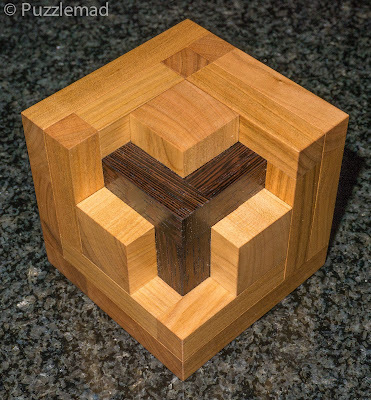 It actually looks like a packing puzzle (when I posted my initial picture on Instagram someone actually asked whether it was a packing puzzle) and bears a similarity to some produced in the past by Eric Fuller (One Hole - reviewed here, or The Core which I regret I didn't buy). However do not be fooled - this is a burr/interlocking puzzle with very unusual shaped pieces which lock together in a really interesting way. There are a few blind ends and it is a delight to get lost in them and have to work back and discover where you went wrong. Gradually as you work through the level 14.1.4.2.2.2 solution you can see more and more of the maze like complex interior but still cannot see enough to plan the disassembly. When the first piece is removed it is with a breath of relief and the rest follow quite quickly. Seriously complex pieces - well done Jakub making something so stable! The disassembly took me so long that I thought I had memorised the movements but apparently I had not done it well enough. That final 4 pieces come apart fairly quickly (although they are very stable right to the end and as you can see 3 of them are very similar. This meant (and still does now when I repeat it) that it didn't just slide back together easily! I knew the rough configuration but not particularly well and had to spend quite a while figuring out the correct piece orientation from scratch. 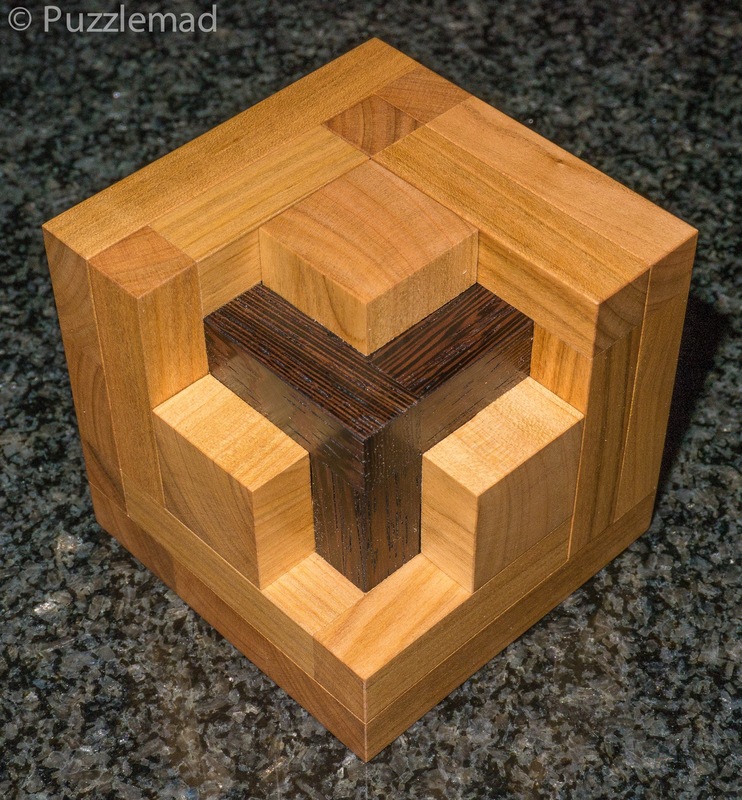 I am not like the late (and sorely missed) Laurie Brokenshire - I really struggle to work things like this out but it is just just possible for me to manage and for those of you who have obtained a copy, I suggest that you have a go at scrambling the pieces and leaving them a while. Burrtools will be able to get you out of trouble if you need it but I don't think you will. Simply fabulous Alexander and Jakub! All but Recede are still available at the moment on the Pelikan site so do yourselves a favour and go and buy them now. They will make a nice Xmas present to yourself or another puzzler in your life. Thank you Jakub for letting me have these.